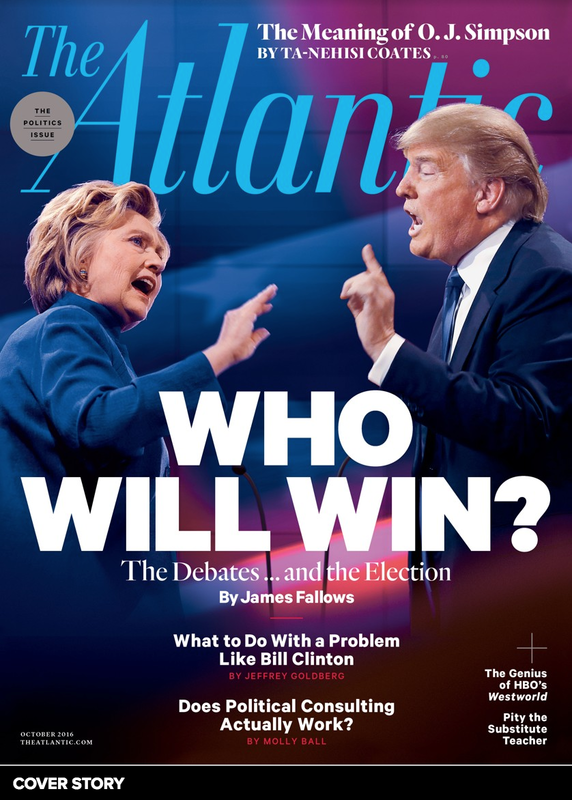 The body language displayed in this first Time Magazine cover (left) is by far the best of the three Senator Marco Rubio (R-FL) shown on this page - although it can certainly be improved upon. His feet cannot be seen but are clearly "felt" to be about a shoulder's width apart - which is very alpha and what is expected to be seen-felt in a leader. Woman leaders, often in an effort to appear feminine, stand with their feet close together and thus appear diminutive and very beta. While the "not-too alpha-but-not-too-beta zone" is (very unfairly) more difficult to navigate for women (a huge double-standard), every female leader should nonetheless endeavor to do so. Women should stand with their feet just slightly closer together than men (about an inch less than shoulder's width) during any such "leadership moments". The Junior Senator from Florida's hands are relaxed - showing no tension. This lack of tension is important. It sends signals of a person who is comfortable in his/her own skin and confident. He looks as if his right hand is about to reach out (perhaps in a handshake, note also that his right shoulder is lower) and he also seems to be leading slightly with his right foot-leg. 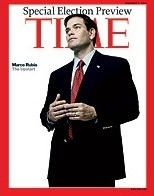 Although this a "static" image and thus only a moment in time, this implied motion gives Rubio a bit of dynamism here. 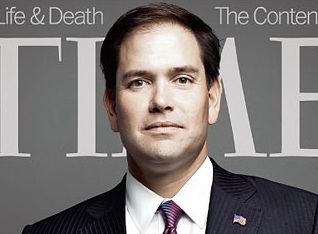 In this close-up from the above cover, Marco Rubio's facial expression shows a trace of contempt. Not the best choice - however it is subtle.While his face is probably meant to show readiness and assertiveness, it would have been considerably better to show a sincere smile. 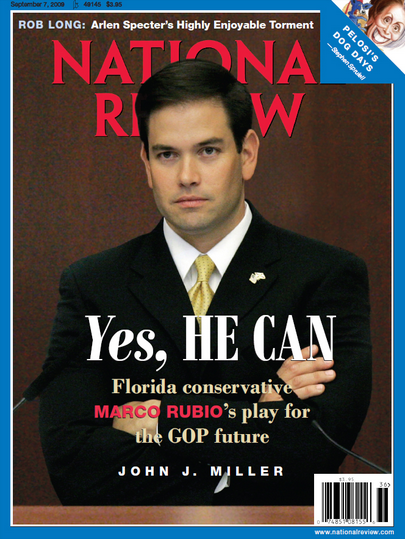 In this National Review cover from September 2009, Senator Rubio like many alpha's - male or female, politicians or CEOs, actors or athletes - have and will continue to pose in this arms-crossed configuration on the front of magazines. It's not only old and it's tired - it's WRONG. It does not send the message they want to project. They are never sending signals of confidence when they pose or adopt this configuration - for this nonverbal is consistent with a defensive and closed-off mindset. Senator Rubio's face also shows clear signals of anger with mild incredulity. 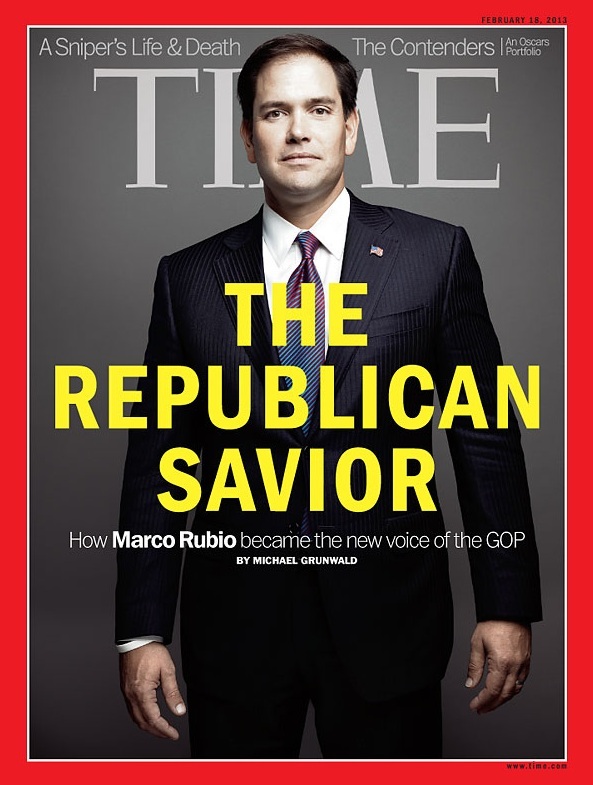 In this lower resolution image of an earlier Time Magazine cover, Senator Rubio is shown in a lower confidence body language stance. Nearly all forms of self-touching signal anxiety, and his particular hand-to-hand nonverbal here is a good example of a beta body language. 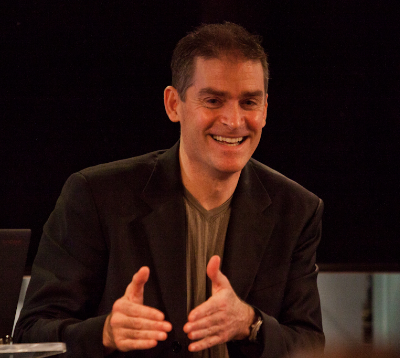 In it, Senator Rubio's nonverbals are considerably non-assertive and demure. He is hesitant. While most people cannot necessarily "bullet point" and dissect this image, they are certainly left with these emotional impressions.